This monster appears in the artwork of The Prime Monarch as a silhouette. It also appears in the artworks of Pantheism of the Monarchs and Restoration of the Monarchs. This is the first female Monarch monster. This monster is likely a reference to the primordial Greek deity, Aether, whom is the representation of light. This is the first Structure Deck card to be numbered 000. This monster has a remarkable visual similarity to Satellarknight Vega. 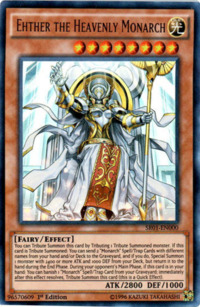 The artwork of Pantheism of the Monarchs seems to imply a possible connection between Erebus the Underworld Monarch and Ehther. In Greek Mythology, Aether (the deity Ehther appears to be inspired from) is the child of Erebus, the personification of Darkness.